Put up to a vote, the fans of NBA 2K spoke. Asked to name their wish list of all-time basketball legends to appear in a special "NBA's Greatest" mode for this year's game, they put Philadelphia 76ers and Phoenix Suns' Hall of Famer Charles Barkley at No. 7 in a poll that tallied more than 330,000 votes. Fans wanted him in last year's NBA 2K11, too, the video game that recreated 10 of Michael Jordan's greatest moments. Interestingly, that title skipped over the 1993 NBA Finals Jordan's Chicago Bulls played against Barkley's Suns, choosing instead a game from the somnambulant 1996 Final that Chicago won against the Seattle Supersonics, and the easiest challenge of the 10 to complete. The Ten Games of NBA 2K11&apos;s "Jordan Challenge"
Reading between the lines, it appeared that Barkley, like the Indiana Pacers' great Reggie Miller (polling No. 5 five on that vote), couldn't come to an agreement with 2K Sports over the use of his likeness, last year or this year. Whatever's going on, either he wants too much money, wants a cover or other promotional considerations 2K can't afford or grant. Or he objects to second-billing under some other star from a cast of dozens highlighting this game. Or, conversely, one of Barkley's old rivals refuses to appear in a game with him. Or, maybe, he signed a Rumplestiltskenian deal with the makers of Barkley: Shut Up and Jam promising them his firstborn if he appeared in another game. Fine. This is all part of the business. If Barkley can't be in the game, let's just write around him, right? 2K Sports made a very strange choice this year. In "NBA's Greatest," the designers paired the 1984-85 Philadelphia 76ers against the Milwaukee Bucks from the same year. The '84-'85 Sixers are, ostensibly, the vehicle through which Julius Erving, one of the spotlighted 15 legends, gets into the game. OK. But 1984-85 is Barkley's rookie year and team. And yet he won't be in the game. Further, on the roster in NBA 2K12 the '85 Sixers have just seven players, the fewest of any team in the game. 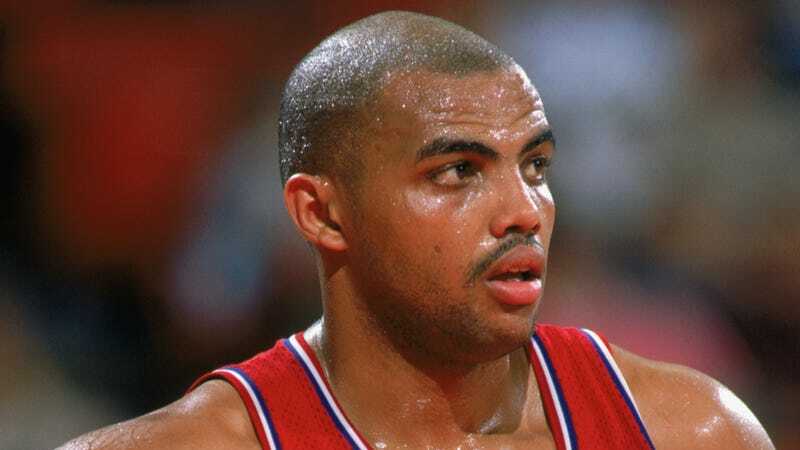 Barkley wasn't some role-player for the '85 Sixers. Fresh out of Auburn, the Wide Load from Leeds appeared in all 82 games for Philadelphia at forward, and started 60 of them. In NBA 2K12, he'll have to be replaced by either Bobby Jones, Clemon Johnson or George Johnson, with a combined 11 starts among all three. And hands up if you've heard of the latter two. NBA 2K prides itself on accuracy and realism. Yet by choice it not only has a team that is missing one of its five starters, that starter was one of the top rookies that season, and is one of the NBA's 50 Greatest Players. Let's look at the other end of the matchup. Maybe 2K Sports wanted to get a special team in against the '85 Sixers, right? Well, the 1984-85 Bucks provide no compelling reason why 2K should have taken the '84-'85 Dr. J team and not one from earlier - like, say, the 1982-1983 76ers, who won the franchise's last NBA title. In fact, the 76ers and the Bucks and their principal stars—Erving and Milwaukee's Sidney Moncrief—had met in the Eastern Conference Finals of the 1983 playoffs. And both superstars, Erving and Moncrief, had better years in 1983 than in 1985. Absent Barkley, not only is there no plausible difference in the personnel of the two teams, 1985 to 1983, the 1983 matchup is in fact better and more historically relevant. And so, where last year, in crafting the Jordan Challenge, the game's creators steered away from Barkley, this year they seem to have aimed directly at him, and his debut year, and yet he is not in the lineup of legends. 2K Sports reminds us that "NBA's Greatest" is not meant to recreate actual great-game moments, or necessarily feature the league's champions. And that's true. The 1971-72 New York Knicks are in this game, as opposed to the 1970 or 1973 teams, both of which won NBA titles with many of the same stars. But they're the opposition to Wilt Chamberlain and the '71-'72 Lakers, a team presumably included because it reeled off an NBA record 33-game winning streak that season. Further, all of the '72 Knicks are in the game, and 2K isn't picking that year to avoid a player from '70 or '73 who isn't licensed. Yes, retired players must all be compensated for their likenesses. Loosely speaking, here's what happens. The NBA's all-time greats, the true legends, typically cut their own deals. These are guys like this year's unprecented three different cover stars, Larry Bird, Magic Johnson, and Michael Jordan, and many of the hall of famers rounding out the rest of the 15 legends. Barkley could be reasonably included in this bunch, especially if the fan vote is any guide. Most of the other retired players, even all-stars among them, are covered under a group license that manages such affairs and cuts the royalty checks. That way, neither players nor producers of memorabilia, DVDs or video games have to negotiate individually with everyone on the team involved. For the product maker, it streamlines access to the use of likeness and for the player, it streamlines the dealmaking process so they get paid with less hassle. Only if you are a big-time star is it worth it to negotiate things on your own. After Julius Erving—and Moses Malone—who are already signed, there is no one on the 1985 or 1983 76ers or Bucks who reasonably springs to mind as a player needing independent negotiations that could hold things up. Bob Lanier and Dave Cowens, both hall of famers, appeared on the '83 Bucks but not the '85 team. But it beggars the imagination that either their demands could be greater than Barkley's or—and this is key—that their absence would be more noticeable to the video gamer. Charles Barkley, one of the league's greatest personalities ever, remains a current, forceful presence, largely through his work as a TNT analyst. The situation is so counterintuitive I have to think ... well, I don't know what to think. Late this afternoon, Kotaku reached out to 2K Sports for a more concrete explanation of the choice of the 1984-85 76ers and Bucks and the reasons why Barkley is not appearing in the game. We were told to expect a response by Monday.